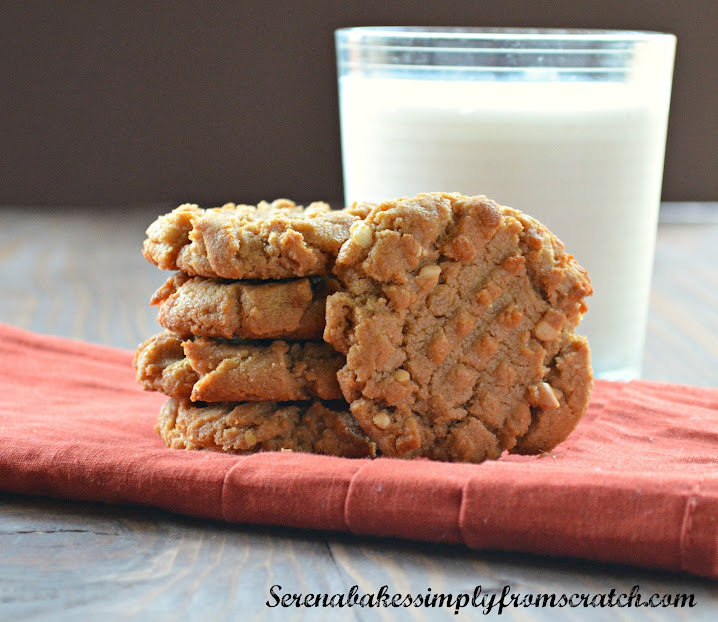 The best Flourless Peanut Butter Cookies with only 6 Ingredient and are easy to make. Gluten Free and includes step by step instructions. I've seen these cookies floating all over the blogosphere. I've actually seen them so much I'm not really sure where to give credit for where the recipe came from. But I can tell you Flourless Peanut Butter Cookies are all the rage for a reason, they are easy to make, crunchy around the edges, moist, chewy and definitely peanut buttery! Everything my heart desires in a good peanut butter cookie! In case you are looking for something egg-less and gluten free make sure to check out GF Peanut Butter Chocolate Chip Bites or GF EF Double Chocolate Peanut Butter Bite Cookies. They are defiantly both favorites in our house! The deciding factor on what treat I was going to make for the kids was this and I was all out of flour too! What was a girl to do? Flourless Peanut Butter Cookies it was because I always maintain an arsenal of peanut butter for the kids lunch's! Combine peanut butter and brown sugar until smooth and creamy. This can be done in a mixer or by hand. Add an egg, baking soda, a pinch of sea salt and vanilla. Mix another minute until fully combined. The dough might look a little crumble but will hold up when scooped with a cookie scoop or tablespoon. Scoop dough onto a Silpat or parchment lined baking sheet about 1 1/2" apart using a standard size cookie scoop or a heaping tablespoon. Use the back of the tines of a fork to form a crisscross pattern. Bake cookies in a 350 degree oven for 10-12 minutes until lightly brown around the edges. Allow cookies to cool for 2 minutes on cookie sheet before moving to a cooling rack. Line a cookie sheet with Silpat or parchment. Set aside. In a mixer or by hand combine peanut butter and brown sugar until smooth and creamy. Add egg, vanilla, baking soda and a pinch of sea salt. Mix until fully combined. By heaping tablespoon or standard sized cookie scoop drop dough onto lined cookie sheet. Use the back of a fork to form a crisscross pattern on each cookie. Bake for 10-12 minutes until edges are lightly brown. Allow cookies to cool on baking sheet for 2 minutes before removing to cooling rack. 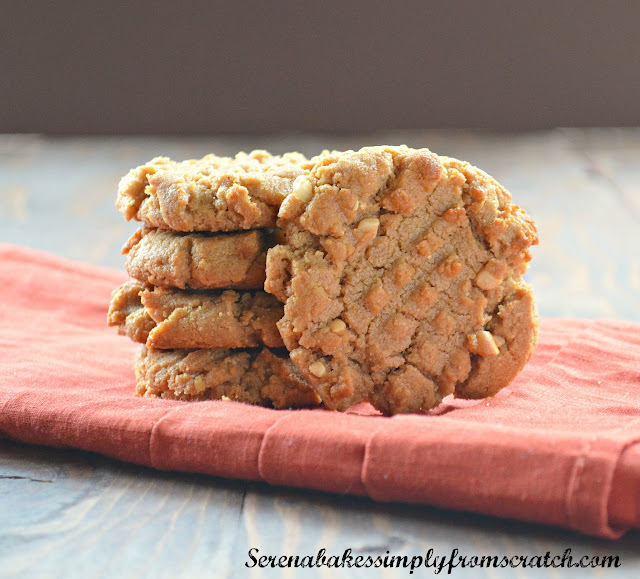 I frequently make peanut butter cookies but I've never tried making it without flour! I'll definitely be trying this, Serena! Thanks for sharing! These were delicious. My family loved them. Thank you! Hi. What is the other 2 TBLS of brown sugar for? I found it was the right amount of sugar. I LOVE peanut butter cookies and can't wait to try this recipe. Based on the reviews - it's a hit! And the photos are sooo yummy looking. Happy to discover your blog via #SITSBlogging! Thanks so much for the info Kathryn.. It's a favorite recipe in our house!